When a huge storm hit the mid-Atlantic states in 2012, it took out power for 2.1 million residents. Storms usually just affect the people in the geographic locations they touch. But this one cut off power to an Amazon-run data center, which housed the physical server for a bunch of popular sites like Netflix, Instagram, Pinterest, and yes, Tinder. Users in California and Connecticut suddenly couldn’t access their favorite platforms because of a storm thousands of miles away. A lot of people didn’t understand what was going on. How could a storm affect Instagram? Could it affect overall Internet service? The event called attention to the digital architecture that keeps the Internet up and working. Here are some of the questions people asked. Can Storms Take Out The Internet? The reason people were so freaked out by the Virginia storm is that it made them realize the Internet can be fragile. This storm took down data centers, which hosted cloud applications. When you connect to something on “the cloud,” it actually does connect to a physical server. The same is true of the actual mechanics of your Internet service. Even if you’re operating from a wireless device, your connectivity depends on physical connections that are prone to damage in storms. 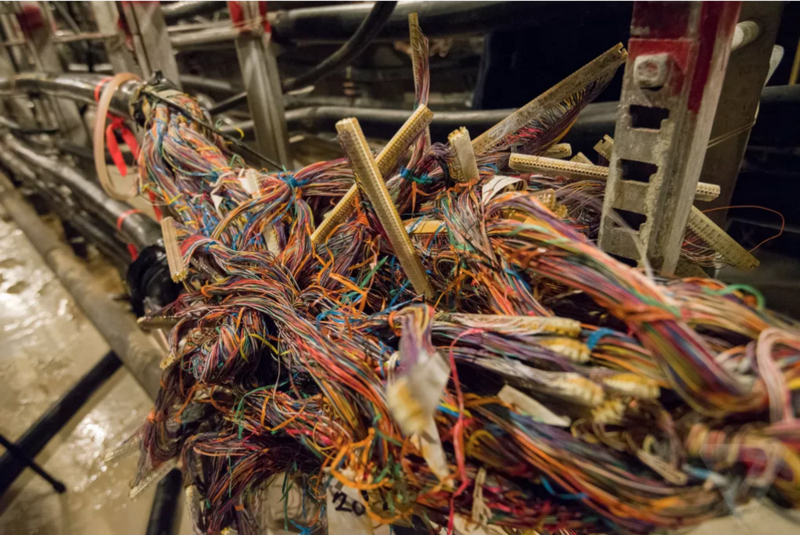 In Verizon’s case, that physical connection for some customers means a 90,000 cubic foot cable vault at the tip of Manhattan. During Hurricane Sandy, a surge of water flooded the vault. That shouldn’t have been a problem, but the air dryer systems that usually pump air through copper cabling tubes lost power. The copper cables fried, and the Internet went out. It took Verizon a couple weeks to get everyone’s service back up and running. When fixing the problem, they replaced the copper cables with fiberoptic ones, which would be able to withstand future storms. So while the storm did take out the Internet for some, it brought about a stronger system that’s able to withstand floods like this in the future. Can I Get Online In A Power Outage? Of course, there’s another way your Internet can go down: a power outage. Power grids are one of the biggest casualties of blizzards and thunderstorms. If there’s a problem with the city’s grid, it can impact connectivity on both your end and your ISP’s. If power isn’t up and running, you’re in for some big problems—although you might be more concerned about the milk in your fridge going bad than checking your email. You may be able to get internet coverage during a power outage through your phone, so long as you still have cell service, since those systems aren’t connected. But if you want to get to the Internet through your ISP, you need good old-fashioned electricity. Even if your laptop is fully charged and not plugged in, it still relies on the grid through your modem and router. Some people have a backup generator specifically for this purpose. It’s called an uninterruptible power supply, and it’s necessary for those who rely on technology they can’t afford to lose access to – like respirators and other medical equipment. But it also works to back up modems and routers when power lines get knocked down. In order for any of this to work, your ISP also has to be up and running. Good news is, they’re getting pretty good at staying connected during bad weather. During Sandy, about a quarter of NYC homes lost power for over 15 hours. But not a lot lost their Internet. Research firm Renesys tracked Internet outages in NYC from October 29th to 30th, 2012, just as Sandy hit the Big Apple. Internet coverage in Manhattan dropped from 99.95% of networks up and running to about 90%. Even so, only 10% of networks is a pretty small percentage. How did the networks stay up even though the power was down? If the cable connections weren’t downed, many ISPs were able to keep up through backup generators. The system is pretty similar to the uninterruptible power supplies. They ensure that data centers are backed up by a power source that won’t go out in a storm. Is My Internet Slower When It’s Cold Out? The bitter cold is one of the worst parts of a New York winter. It freezes water in your pipes. It prevents your car from starting. While the cold can maybe make waiting for a site to load feel longer, freezing temperatures don’t freeze the Internet. However, cold weather can cause damage to your system, causing it to slow down or act up in the future. This varies greatly depending on what kind of network you have. The same weather system can have radically different effects on your neighbor’s internet simply because they have a different ISP, or different kinds of cabling. Copper can still conduct electricity in cold weather. However, copper systems aren’t great at withstanding extreme temperatures. Fiber optic cables fare better in freezing cold temperatures simply because they don’t send electricity, they send light. That means their ability to transmit data isn’t impacted by temperature. What Do Clouds Do To The Cloud? Satellite internet works a bit different than cable systems. It’s primarily used in rural and suburban places where it doesn’t make sense to run wires out to houses which are few and far between. However, if you live in a remote place and you don’t want to hear that 90’s dial-up tone every time you check your email, it might be the best option. Satellites beam internet service from about 22,000 miles out in space. It’s a huge distance, but it’s usually a piece of cake – unless there’s a storm. If you have satellite TV, you know the experience. You’re watching a football game and all of a sudden: snow (in the air and on your screen). It’s the same with the internet. If there’s a huge weather system in the way, it can interrupt that service. Even if you don’t have satellite service, there’s another reason your internet might be slow when it’s gross out: increased traffic. The connection can really slow it to a crawl if there’s too much traffic. And when it’s super gross out, a lot of people tend to stay inside aka go online. Generally, peak internet hours are between 7 and 9 pm on weekdays, when everyone is home from work and chilling out. Interestingly enough, a whopping 35% of this traffic is on Netflix. The same goes for when it’s rainy or snowy. People stay inside—especially if they’re home from work, and this increased traffic can bring your service down. Is The Internet Ready For More Superstorms? Losing your internet because of a storm can be a scary thought, especially given the increased frequency of dangerous storms like Irene and Sandy. But the digital architecture we rely on is getting stronger and stronger. Not only are companies like Amazon developing more resilient structures for catastrophe scenarios, ISPs are providing better systems – powerful satellites, fiberoptic cables, and more backup centers – all designed to withstand severe weather.